Jim Joyce is clearly one of the most respected umps in the game. The comments that have poured in since the missed call get that message across without doubt. He missed a call. Another no-doubter. Armando Galarraga finished the night with a complete game shutout, allowing 1 hit. No Perfect Game. Let's face it, everything has to go just so, for a perfect game to occur. Pitchers need to get calls going there way, they need players to make outstanding defensive plays (boy did he), it has to be...perfect. Bad calls are a part of baseball though, and this one just happened at the worst time. Imagine if Joyce blew the very first call of the game, and then Galarraga went perfect from then on. I wonder if the reaction would be the same? Part of me says yes, part of me says no. I think it would be much easier to accept. Jim Joyce may be the reason that it was not a perfect game, it would be great to put a players name in that spot, but it isn't so. The fact human error changed the game is actually why I like baseball. Crazy as it may sound. I like that strike zones change from ump to ump, and that guys miss calls. It reminds me that it's not perfect, and that perhaps we shouldn't be putting these items on the pedestals we do. They're just dudes playing a game. Armando has an awesome story for the grand kids. With the drama around it, how he was looked at as nothing but classy with the way he handled the situation, one of the most respected umps looked him straight in the eyes and told him he messed up, and it was tearing him apart. He'll be treated as a hero from the hometown fans regardless, and rightfully so. To top it all off, I like that Bud Selig stuck by the call. Every little leaguer, beer leaguer, or semi-pro leaguer can learn a lot from this. Sometimes bad calls happen, but you have to handle it like a big boy and move on. Galarraga was amazing, not only did he keep his cool initially, and therefore kept himself in the game, but he got the out. To top it all off, right after the game they shoved a camera in his face, and he still kept it cool. 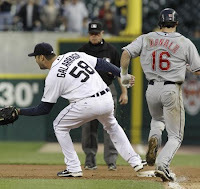 Baseball is to be a gentleman's game, and Galarraga has shown the definition of gentleman. He pitched an amazing game, but the stars weren't in line this night, and it wasn't perfect.